The Airedale Terrier is a medium 45 to 65-pound dog that usually reaches between 22" and 24". Known as the King of the Terriers, they are largest of the Terrier breeds recognized by the AKC. It is a compact little powerhouse that is all terrier when it comes to chasing little animals or appeasing its curiosity. Airedale Terriers are typically tan on the ears, head, chest, undersides, legs, and sometimes on the shoulders. They are black or grizzle on the sides and upper parts of the body. Sometimes they have a red mixture on the black or white markings on the chest. Certain strains of the breed also have a small white patch on the chest. Their wiry, dense outer coat requires regular grooming. If you are looking for a dog with plenty of stamina and energy, look no further. 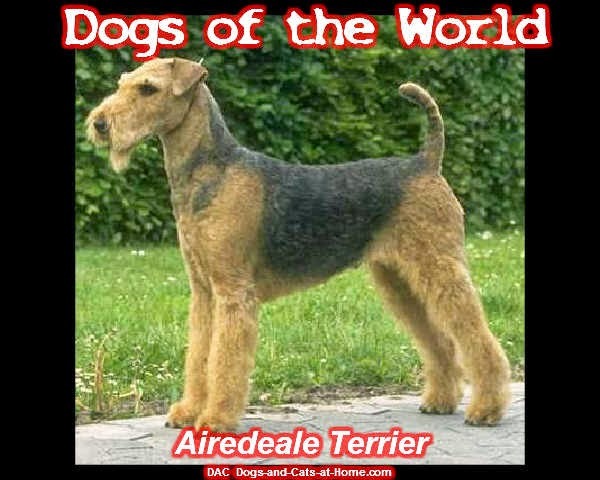 The Airedale Terrier is full of energy and needs daily exercise and play. Generally speaking, they do best with older well-behaved children and are not ideal for homes with smaller pets as terriers have the tendency to chase small animals and vermin. They can do well with other dogs, especially if they are socialized from puppyhood. They are loyal and protective of their family. They love to learn and can be trained easily provided training is fun and not monotonous. For a family that enjoys outdoors and exercise, the Airedale Terrier is an excellent choice. Although they can work with other pets and dogs, a one pet household seems more ideal for their needs unless they grow up with other family pets. The Airedale Terrier is a great pet for the family on the go. 1) Can’t teach an old dog – You have to start training your Airedale terrier pet dog as early as possible. This is because of the fact that the earlier an Airedale terrier pet dog learns a trick, the faster they will be able to learn it. This doesn’t just apply to tricks. It also applies to general behavior. When your Airedale terrier pet dog is still just a puppy, you need to start training it. This way, the behavioral training that you give it will be ingrained into the Airedale terrier pet dog’s brain. This way, proper behavior becomes almost instinctive to the Airedale terrier pet dog. 2) Use, don’t abuse – Various training methods are made available to you by various experts. However, there’s one thing you should know: they only work with proper use. Some people make use of the leash or of the crate to abuse their animals. What you need to know is that each method of training can only be effective if used in a way that will not harm the animals. You need to be firm but gentle with your animal when you are trying to train it. Use the various implements humanely in such a manner that will encourage your dog to behave well and not scare it from behaving badly. 3) Habit inside, habit outside – Before taking your Airedale terrier pet dog outside, try to observe its behavior inside. This will give you a clue as to how the Airedale terrier pet dog will act outside the house. Many people say that a dog’s behavior inside a house is very different from the way that the same dog will act in outside environments. This is not true. 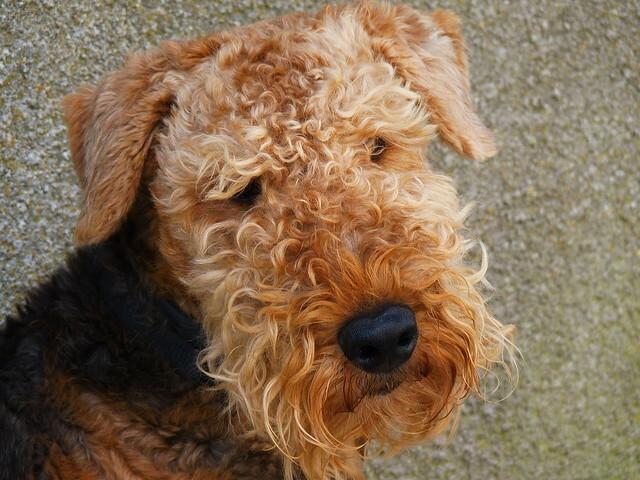 By observing the inside behavior of your Airedale terrier pet dog, you will realize how it will respond to you outside. If your Airedale terrier pet dog does not listen to your commands inside the house, how can you expect it to listen to your commands outside the house where there are things a lot more interesting to a dog than your commands are? 4) Keep your temper – Training an Airedale terrier pet dog can understandably be very frustrating. However, you should not lose your temper. Negative actions such as hitting or shouting at your dog will not accomplish anything positive. Sometimes, we have a tendency to take out our frustrations on helpless pets. Do not blame your problems on the dog. If you know that you are having a bad day, do not even think about training your dog. All that you might get from the ordeal is a bad case of hyperacidity. Your dog will learn nothing and that would only increase your frustration. 5) Timing – Timing is always important. You need to make corrections regarding your Airedale terrier pet dog’s behavior while those corrections are still relevant. If you praise or correct the wrong timing, you would only end up confusing the dog. Actually, the best timing you can use is to correct the Airedale terrier pet dog before he or she even starts to misbehave. 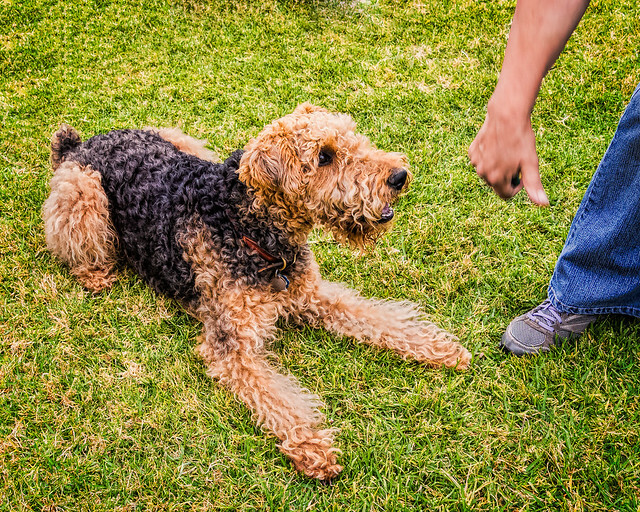 These five tips can help you a lot in keeping your Airedale terrier pet dog’s behavior in check. By following these tips, you can make training your dog an easy task.